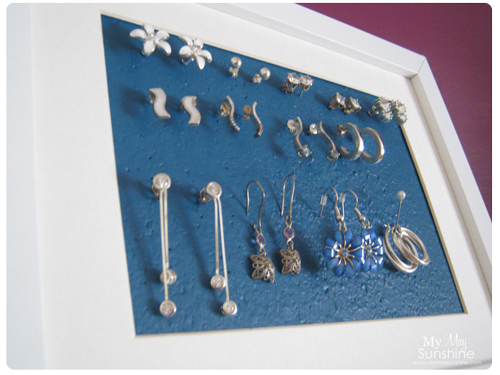 When it comes to storing earrings, I knew that I didn’t want to just put them in a box because I knew that I wouldn’t wear them and forget what I had. I decided that I wanted to display them in a way that would be quick to choose and easy to wear them. I am a bit of creature of habit and tend to stick to a few pairs of earrings so I don’t have too many and tend to stick to silver earrings. I used a frame and took the glass out of the frame and added some cork which I painted in a teal colour. The frame is an Ribba frame from Ikea. It is 26cm high and 20cm wide when stood up. The frame can be either stood up or laid down. I chose to lay it down so that I could make a few rows of earrings. To attach the earrings, I just used one of the pins that I was going to use for the hoop earrings, to make a hole in the cork. Then the earring just fit in the hole and I made sure that I didn’t push them in too far. 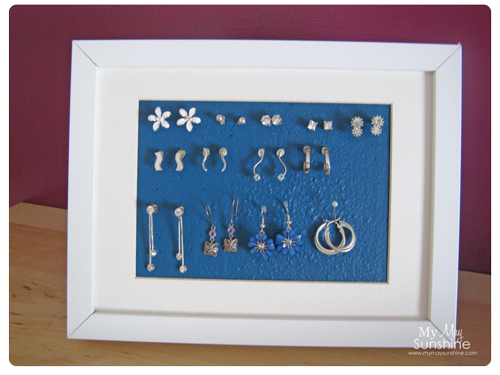 The earrings don’t tend to fall out as the frame sits back slightly on the stand so it stops them falling forward. I like the way that I can just put it on a shelf and it looks pretty and sorts my earring out at the same time? Also in Ikea, you can get large Ribba frames and so I thought that would work if you had large amount of earrings.